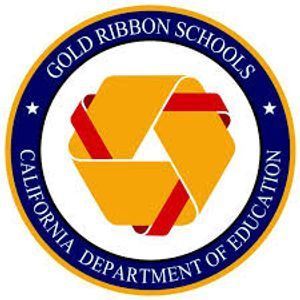 Dougherty Elementary School, Green Elementary School and Murray Elementary School have been recognized by the State of California as Gold Ribbon Award honorees. The California Department of Education officially announced the Gold Ribbon Award recipients Wednesday afternoon. Dublin's three honorees were among 29 in Alameda County and 772 statewide. "We are proud of Murray, Dougherty and Green Elementary schools for their ongoing work to improve student learning," said Dublin Superintendent Dr. Stephen Hanke. "Recognition as Gold Ribbon schools is a validation of the outstanding efforts of teachers, support staff, parents and students. We congratulate the three schools for receiving this prestigious award." Schools applied for the award based on a model program their school has adopted that includes standards-based activities, projects, strategies, and practices that can be replicated by other local educational agencies. The award recognized middle and high schools in 2015. The Gold Ribbon awards recognize California schools that have made gains in implementing the academic content and performance standards adopted by the State Board of Education. For Dougherty Elementary, this is the second significant honor in the last two years. James Dougherty became Dublin Unified's first National Blue Ribbon School in 2015, honored by the U.S. Department of Education. Dougherty was also named a California Distinguished School in 2012. "James Dougherty is proud to receive the Gold Ribbon Award," said Dougherty principal Brett Nelson. "It is the commitment of the staff to serve every child through our "Response to Intervention" that has translated to a significant increase in our most at-risk students." Green Elementary principal Joe Romagna expressed appreciation for the honor. John Green was named a California Distinguished School in 2012 as well. "It is truly an honor to have John Green recognized as a Gold Ribbon School," Romagna said. "This award is the direct result of the hard work and dedication of students, staff, and the community of our school." Murray Elementary was most recently named a California Distinguished School in 2008. "Magical Murray is honored to be a recipient of the Gold Ribbon Award" said Murray principal Carrie Nerheim. "We will continue our commitment to every student to serve their educational, social and emotional needs." All three schools will be honored at the California School Recognition Program on May 5 in Santa Clara. 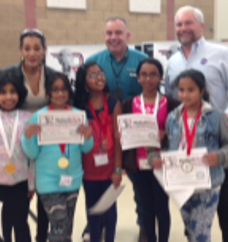 Last weekend Feb 20th - 21st, Three kids Shreya Krishnan Grade 5, Deepika Puli Grade 5 and Jothika Puli Grade 5 from John Green Elementary School participated and won Second Place in Robotics competition “Robo Rave International” held in Fallon Middle School. They won second place in the Line Following Challenge. Their challenge was to build an autonomous robot that must follow a line to a tower, stop, deliver at least 1 ping pong ball, and return to home under 3 minutes. They worked really hard for 4 weeks and built an amazing robot with wheels, sensors, and code to intelligently track the black line, delivery balls and return back to start line. 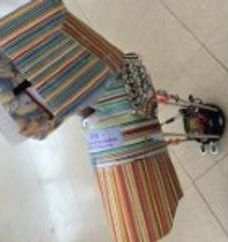 They faced many challenges during the completion which required them to constantly redesign and recode the robot to perform the required tasks. Outside the competition they had the opportunity to meet and share ideas with kids from other schools from Pleasanton, San Ramon and Fremont. They also had the opportunity to chat with members from the NASA team on various projects and efforts happening in NASA building Robots and Roovers for missions to MARS. They had so much fun and learning during those 2 days. All thanks to their coach Rengan Krishnan dad of Shreya Rengan who coached and trained them to build the Robot, and win the competition.